Cold brew is the best-kept secret the coffee world has been brewing for centuries. Cold brew coffee was invented in Japan during the 1600s and more recently popularized by upscale coffee shops. Cold brew is often confused with iced coffee but they’re actually very different! Iced coffee is made from coffee grounds brewed in hot water that is cooled down by serving over ice. Cold brew coffee uses a different process - making use of cold water to extract the natural flavors instead of brewing with hot water. Cold brew is really a game changer. Brewing coffee in cold water means that the coffee is never exposed to heat during the brewing process. With the traditional method of hot brewing, the boiling water extracts the flavor from the coffee in a very short period of time. Cold brew has a much longer extraction process, often over 12-24 hours, which produces a brew with unique characteristics that coffee lovers around the world are falling in love with! "Brewing coffee in cold water means that the coffee is never exposed to heat during the brewing process." 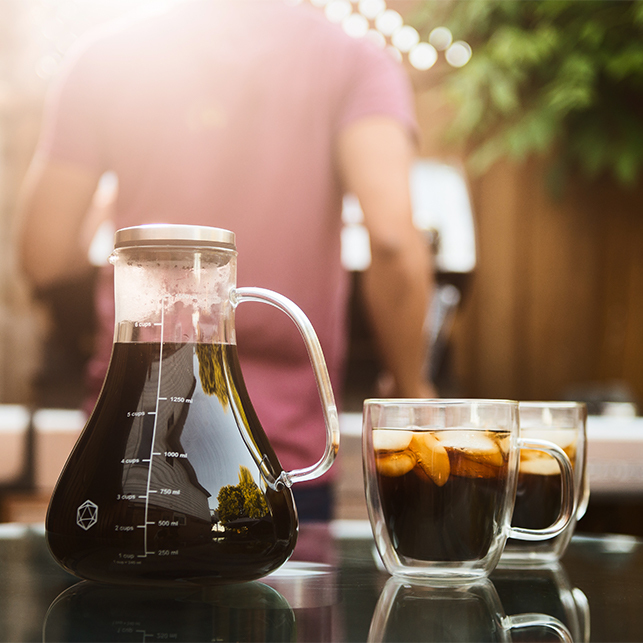 With at-home cold brewing becoming more popular and much easier - coffee fanatics are skipping the coffee shop and starting to take control of their coffee experience. All of this makes cold brew coffee the hottest trend this summer. When coffee is exposed to high temperatures of hot water brewing, it loses some of its natural health benefits. Coffee naturally contains antioxidants and other beneficial nutrients - these are preserved during the cold brewing process! Cold brewing extracts the delicious flavor compounds in coffee while it leaves behind the bitter oils and fatty acids (including some less desirable compounds such as ketones, esters, and amides) that get released during hot brewing. The result is a delicious tasting coffee. Love coffee but don’t love the acidic “bite” that comes with it? You’re not alone! Cold brew is 67% less acidic than hot brewed coffee which means that not only does it have less “bite” but the reduced acid also makes it healthier for your teeth and stomach. Do you like your caffeine? Need that boost in the morning? The cold brewing process extracts more caffeine. Which is why a regular cup of concentrated cold brew coffee comes packed with more caffeine that a traditional hot brewed coffee. This explains why coffee lovers often like to mix cold brew concentrate with something else like water or milk. Cold brewing takes less than 5 minutes to prep a batch. It’s so easy anyone can do it at home! Simply prepare it (we love using the Arctic), place it in the fridge, let it brew for 12-24 hours, and then enjoy! The freshly brewed cold brew can stay fresh in your fridge for up to 2 weeks - so this means with very little effort you'll have fresh cold brew every day. Cold brew is great COLD but what people often don’t know is that it's just as great HOT! Once you have the cold brew concentrate, you can be creative in using it a base for virtually any hot or cold coffee drinks. If you’re feeling adventurous, you can even use it to bake or make original cocktails. The possibilities are endless! It’s so easy. All you need is a few minutes of prep and it will save you time and money from those coffee shop visits. Cold brew from your local coffee shop can be around $5 (or even more!) per cup. If you drink a cup each day, it can quickly add up (think $5x30cups=$150/month). Brewing at home all you need is water and your favourite beans. Not to mention it's super convenient - the brew can be saved in your fridge for up to 2 weeks so you can have it fresh every morning. With all of the abundant benefits that cold brew offers, it's no wonder the coffee world is starting to notice. The increase in popularity also comes with how easy it is to begin brewing at home along with the convenience with brewing in large batches. Great tasting coffee no longer needs to come from the coffee shop and this saves coffee lovers both time and money. If you're looking for great cold brew recipes (such as this Cold Brew Mojito) or the easiest/most popular way to brew cold brew at home (the Arctic was brought to life by 10,000 coffee lovers around the world!) - we got you covered. Join our coffee community by subscribing below for more coffee tips, recipes, and member only offers!